In 1701, Lord Asano Naganori 浅野長矩 (pictured below) living in Ako, was summoned 400 miles away to Edo (now Tokyo) to fulfill part of his Samurai duties by arranging a fitting reception (along with Lord Kamei of Tsuwano) for the envoys of the Emperor of Japan. They were placed in the expert care of a powerful Edo official and master of ceremonies Lord Kira Yoshinaka 吉良義央 to be instructed in the ways of court etiquette. Lord Kira quickly became upset with the two, either because he didn't receive nice enough presents from them or had not been offered the bribes that he wanted and routinely berated and insulted the pair. In fact Lord Kamei was so angered and humiliated that he gathered his counselors to discuss his plans to kill Lord Kira in retaliation for his rude remarks. Kamei's advisors knew that killing Lord Kira would mean death to their master Lord Kamei, his family and all his clan and therefore decided to pay Lord Kira a bribe (in secret) to spare everyone's lives. The bribe worked and Lord Kira was soon pleasant to Lord Kamei who accepted this change of heart and continued his studies. Lord Asano who had been silent throughout, now had to endure a larger dose of Lord Kira's marks to his character and being a rigidly moral Confucian would likely have seen Lord Kira as an immoral jerk to repeatedly taunt and humiliate a person in public to receive an illegal bribe. Finally, on April 21, 1701 (the very day the envoy were to arrive from Kyoto), in the Great Pine Corridor of Edo Castle, Lord Kira called Lord Asano a "country boor with no manners" and Asano could take no more. He lost his temper and drew his dagger, his first thrust wounded Kira's face and the second missed and hit a pillar. By then, guards ran in and separated the two. Depicted above, Lord Asano draws his weapon against Lord Kira. Drawing a weapon within the walls of Edo Castle (the Shogun's palace) was strictly forbidden, and Asano was punished that same day. Asano was sentenced by the leader of the Tokugawa Shogunate (who ruled Japan), Shogun Tokugawa Tsunayoshi 徳川 綱吉, to commit seppuku (a painful death by self-disembowelment). Asano's goods and lands were to be confiscated after his death, his family was to be ruined, and his 300 retainers were to be made ronin. Before Lord Asano honorably commited seppuku he wrote the following poem. "More than the cherry blossoms, inviting a wind to blow them away.... I am wondering what to do with the remaining springtime." Messengers sent word of Lord Asano's death to Asano's head chamberlain (and Samurai) Ōishi Yoshio (pictured below) and demanded that Asano's goods and land be freely given up. He managed all administrative issues, and persuaded the other Samurai (approximately 300 of Asano's men) to vacate the castle and hand it over to the agents of the Shogunate. Ōishi filed the necessary paperwork to receive permission to re-establish the house of Asano, but his attempts to clear his master's name had failed. With no alternative, Ōishi assembled 46 of Asano's most loyal samurai and began to plot revenge on Lord Kira. They banded together, swearing a secret oath to avenge their master by killing Kira, even though they knew they would be severely punished for doing so. Lord Kira was suspicious that Asano's men would attempt revenge, so he immediately set about adding new reinforcements and hiring spies and more men to protect his home. As Ōishi received word of Kira's added security, he devised a plan to put Kira off guard. To quell the suspicions, the Forty-Seven Ronin dispersed to different towns and became tradesmen or monks. 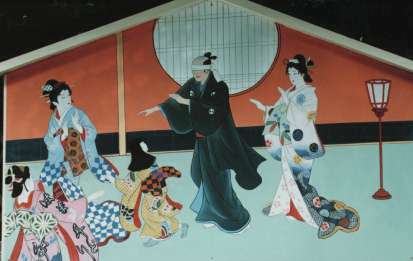 With Kira's spies following him, Ōishi took up residence in Kyoto, and began to frequent brothels and taverns, this went on for months as if nothing were further from his mind than revenge. One day, as Ōishi returned drunk from a night out on the town, he stumbled in the street and fell asleep in the gutter, with all the passers-by laughing at him. A Satsuma man even took the time to abuse and insult him, going so far as to kick him in the face and spit on him. Kira's agents reported all this to Kira, who slowly became convinced that he was safe from the ronin of Asano. After a year and half of similar reports, Kira saw them as harmless and lacking funds from his "retirement", he reluctantly let down his guard. When this happened the forty-six ronin gathered in Edo, and started working out details for their revenge and some even managed to get jobs in Kira's house, and became familiar with the layout of the house. Others gathered arms and illegally transported them to Edo. Each of the Forty-Seven Ronin worked in secret to create (by hand) the armor they would use on the day of their revenge. Ōishi Yoshio's handmade armor (shown below) is still preserved in a museum near his home in Osaki, Hyogo, Japan. When Ōishi was convinced that Kira was thoroughly off his guard, and everything was ready, he fled from Kyoto avoiding the spies who were watching him. The Forty-Seven Ronin gathered at a secret meeting-place in Edo, and renewed their oaths. On a snowy Thursday morning on December 14, 1702, Ōishi led his men to Kira's mansion and conducted a raid. Four men scaled the wall to tie up the guardsmen and open the gate from the inside, while messengers sent word to Kira's neighbors explaining that they were not robbers, but exacting revenge on Kira and no innocent people would be hurt. As the neighbors hated Kira, they did nothing to hinder the plot. After a fierce struggle the Kira's retainers were overcome - sixteen were dead, twenty two injured and the rest were subdued, but there was no sign of Lord Kira. The ronin searched the house and came up with nothing, it would have been shameful for Kira to hide, so it was assumed that Kira must not have been home. To be sure, Ōishi felt Kira's bed to see if someone had been sleeping in it. When it was warm, Ōishi ordered an extensive search of anything that might be a hiding place. Finally a man was found hiding in woodshed in a secret courtyard (accessible through a panel behind a hanging scroll on the wall). He lashed out with a dagger at those who found him, but was easily subdued. Although the man denied it the searchers felt sure it was Lord Kira and blew the whistle to gather the ronin. When Ōishi arrived he turned his lantern on Kira's face and recognized the scar that Asano had given him. He then dropped to his knees, addressed him properly informing him that they were Asano's retainers come to avenge their master's death and invited Kira to die as a Samurai should (by seppuku) and offered him the same blade Asano used to kill himself. No matter how they tried, Kira remained crouched, speechless and trembling. At last seeing it was useless to ask, Ōishi ordered the ronin to pin Kira down so Ōishi could take his head. One young ronin was sent to complete an additional mission while Forty-Six of the Forty-Seven Ronin started their 6 mile journey to Asano's grave at Sengaku-ji. News of the ronin's revenge travelled fast around Tokyo and as the Ronin marched, citizens and shopkeepers would stop the ronin to offer them rest and refreshment (pictured below). 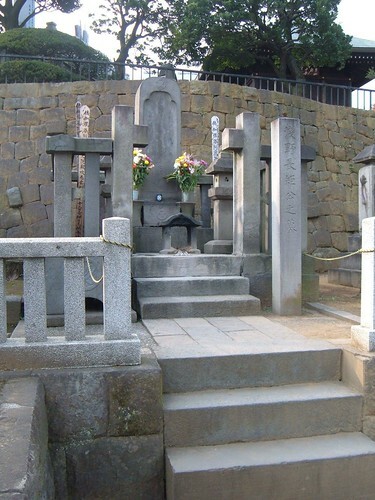 ...then placed Kira's head on their master (Lord Asano)'s grave (pictured below) along with the dagger Asano used to commit seppuku. After requesting that the Abbott safely return Kira's head to his family they each gave him all the money they had to ensure they would receive a proper burial and turned themselves into the authorities. Following an investigation, and leaning on the newly found popularity of the Ronin, the Shogun sentenced each of the men to death by seppuku (self-disembowelment). As this was an honorable sentence (better than the criminal sentence of decapitation) they accepted this sentence as an honor. On February 4, 1703 the Forty-Six Ronin successfully committed seppuku and were buried at Sengaku-ji near Lord Asano. 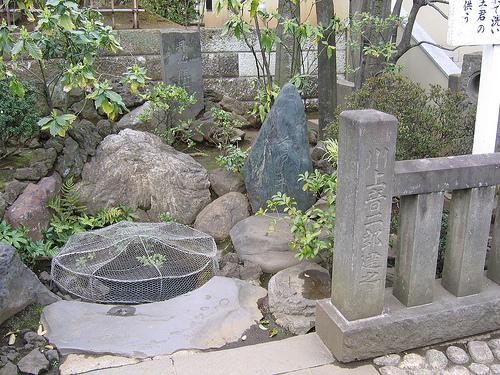 To this day, you can pay your respects to the forty-seven ronin, see the well that was used for cleaning Kira's head and Asano's grave where the head was lain and even visit a bronze statue of Oishi Yoshio (leader of the ronin). Click here for more information on Sengaku-ji. 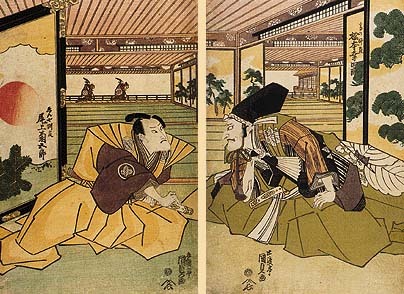 Two weeks after the ronin died a play opened telling the mostly true tale of the ronin (the fable is commonly referred to as "Chushingura"), fictionalized because the names had to be changed for fear the controversial play would be shut down. The Ronin became so popular that by the time the Forty-Seventh Ronin returned from his mission to accept his punishment the Shogun took mercy and pardoned him. When the ronin died of natural causes at the age of 78, he was honorably laid to rest at Sengaku-ji next to his brethren. The legend of the Forty-Seven Ronin spread so far that the Satsuma man who kicked Oishi's face and spat on him heard the legend and made the pilgrimage from Satsuma to Sengaku-ji temple to pray at Oishi's grave and ask him for forgiveness, now that he could see what a truly great Samurai he was. He then committed seppuku and has also been buried at Sengaku-ji.